Available on Blu-ray (3-Disc) and DVD (5-Disc) 462 minutes. When I first started doing reviews for studios on this site, the very first review I ever did was for Agatha Christie’s Poirot Series 6. I had watched a few of the episodes before from the old A&E releases but it was kind of hard to know what was released and in which order they were supposed to be watched. I would occasionally grab a few discs from the library to watch them but that was it. 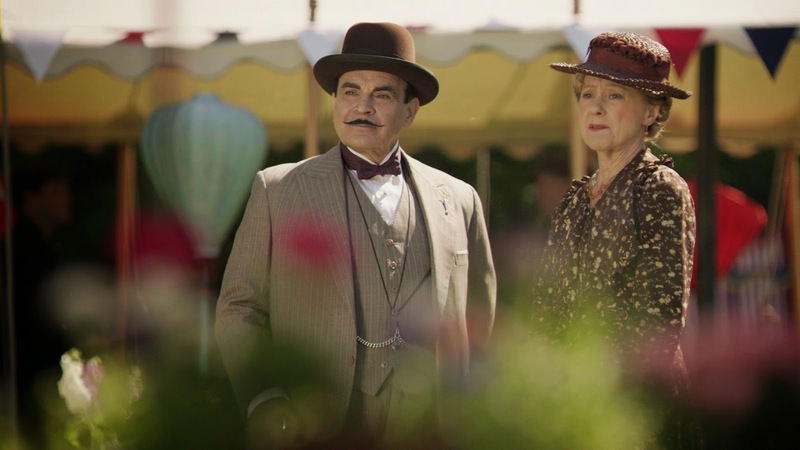 When I had a chance to review Series 6 of Agatha Christie’s Poirot, I was immediately intrigued because the series was getting a re-release from Acorn Media. What was happening was that all the previously released volumes were going to get a new release but this time not only would we get these in the UK broadcast order but they would go back to the original film elements and give us a Blu-ray release too. I very recently gushed about another release that had a lot of HD care given to it. I can’t help but to think of when I was writing my first review as I am now about to write the final review for my favorite Belgium detective Hercule Poirot. Series 13 is the final series of this amazing program that began in 1989. 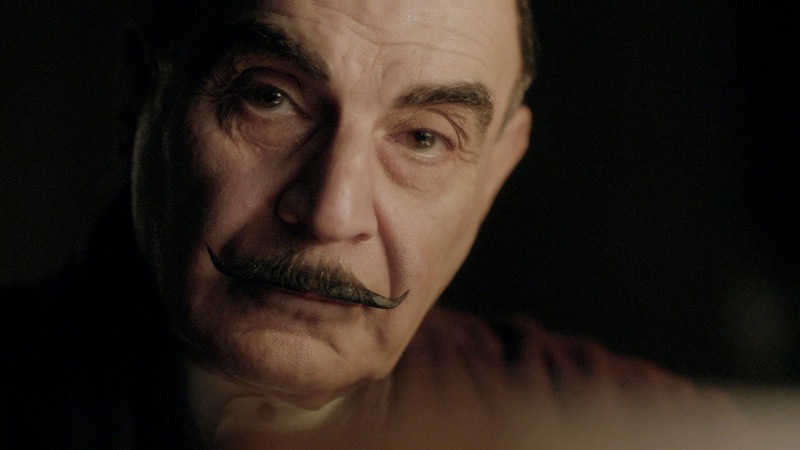 I like to talk about definitive versions of a character and David Suchet playing Poirot is easily to me the most definitive. 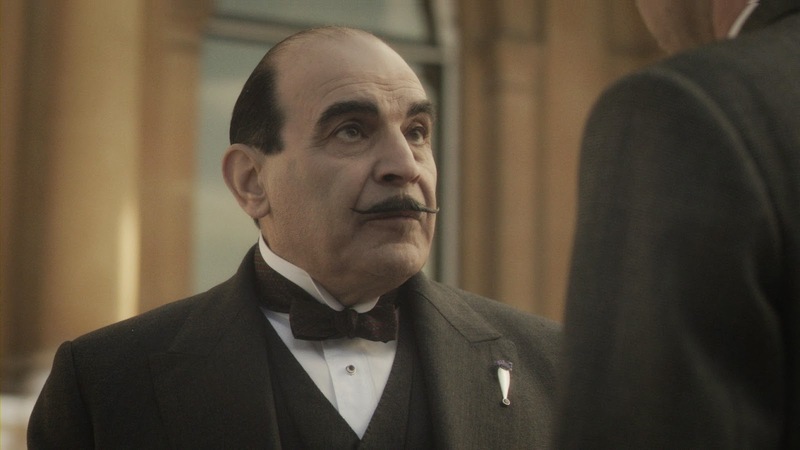 Over the course of 25 years, we got to get to know this detective and actually see how television has changed over this period of time yet Poirot himself always stayed the same. I have written a lot about the final series of this program, mainly over on my column on DVDTalk, Brit-streaming, but I still have much to say. I am always curious how TV series end their run. I have said elsewhere that the greatest achievement a series can attain is being able to end its run on its own terms. When a series can have a final episode, it is a great achievement. I am not a big film buff. This may not come as a shock to anyone but most of the stuff I watch is British television. It is amazing that I can watch something like Agatha Christie’s Poirot which is virtually a feature film in every episode. 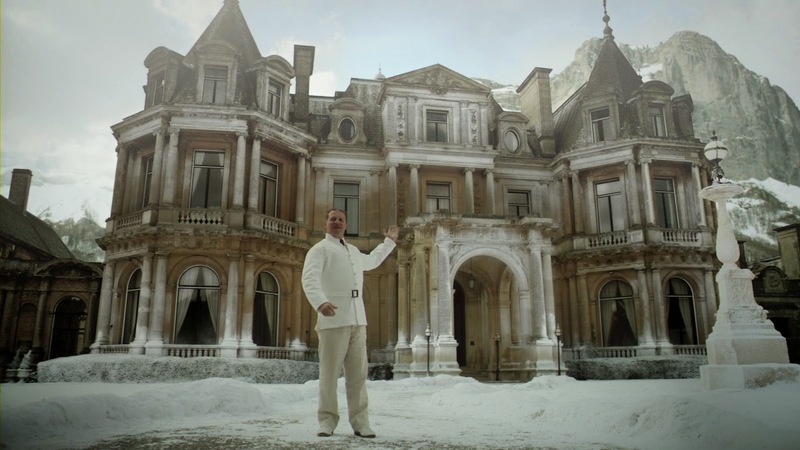 Agatha Christie’s Poirot has given us a tradition of amazing locale plus some very wonderful recreations of England if not Europe of the time. The final run take up 5 episodes. 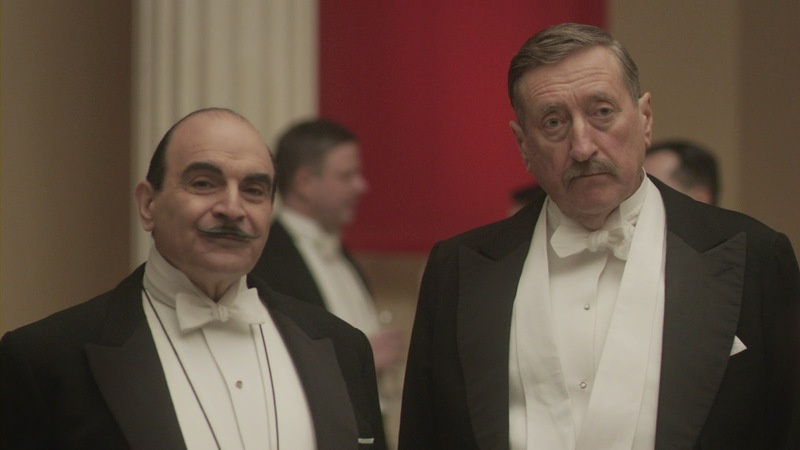 I feel like for a few series that Agatha Christie’s Poirot had lost its way a little but the last few series have been phenomenally enjoyable to me. This series has been very strong with some great stories and some beautiful locations. The favorite of this set of episodes for me is The Labours of Hercules. Don’t let the title fool you. As it happens, this is the last episode of Agatha Christie’s Poirot that I had seen. I opted to watch Curtain: Poirot’s Last Case first since I was really curious how closely it followed the novelization. The Labours of Hercules is visually stunning. This point alone made it so enjoyable to watch. It takes Poirot to the Swiss Alps where there is murder. It tangentially is linked to something that Poirot did 3 months earlier which ended in disaster. He did not travel to the Alps to continue this investigation but he was called into action and it was too irresistible for him to pass up. What is very interesting is with this being the last new episode of Agatha Christie’s Poirot that I had seen, I actually guessed the murderer quite early on which shows I have passed the Agatha Christie School of Mystery just in time as the series ended. As it happens, my least favorite episode in this set is the final episode Curtain: Poirot’s Last Case. The novel is an oddity which makes the episode an oddity. As I have written in other places, Curtain: Poirot’s Last Case was published in 1975 but was written in the 1940s. This was originally written during World War II. Agatha Christie as well as manly who lived in the UK feared for their lives during the war. There was a constant fear of invasion or just death. Christie wanted to have a proper end for her Belgium detective and wrote this novel and had it locked away until she felt the time was right for the novel to be published or possibly until after her death. Agatha Christie died in 1976 though she gave her permission for the novel to be published in 1975. Her final novel she wrote of Poirot was Elephants Can Remember in 1972. The novel for Curtain: Poirot’s Last Case itself is a bit of a curiosity since it was written in the 1940s and before it was published there were many more Poirot novels, this story makes no reference to them because they weren’t written yet. 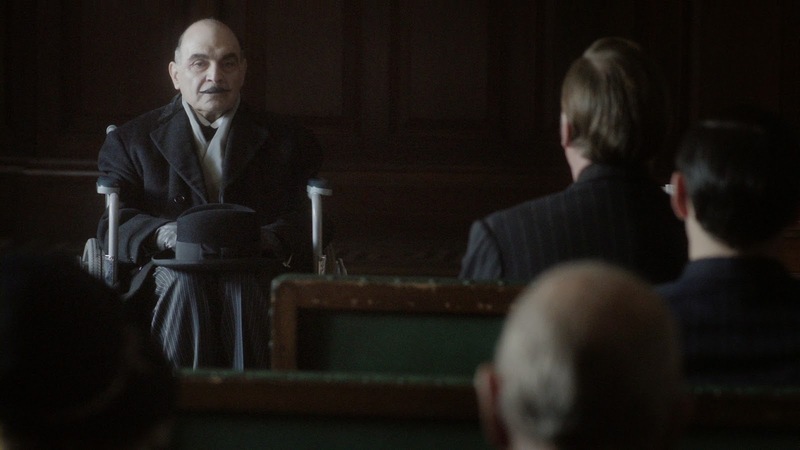 In this final episode, Poirot himself is aged and riddled with arthritis. He is wheel chaired bound but there is more going on than he is saying. His oldest friend Captain Hasting visits him and as it happens, they are at Styles Manor House which is where they solved their first murder together. Such happy memories! The final episode is very stark with the color of all scenes slightly muted. It is actually very sad but a fitting end to a wonderful series. That being said, I much remember him in other episodes where he is more like his old self such as the The Big Four. The Big Four is quite the powerhouse episode. The story is about a group of people who have enough power and influence that they have influence over everything. This is on the edge of England entering World War II. Of course nothing is as it seems. This is such a fascinating episode and looks beautiful. The best part, for me, is that we see the original characters together again one last time. Most of the episode focuses on Poirot and Japp which is such a treat to watch. We also see the return of Captain Hastings and Miss Lemon. This is the last time that they are all together in Agatha Christie’s Poirot. As cool as it is to see them, it is just one more reminder that we are nearing the end of the series. The last two stories of the set are good (after all, they all are good) but not as strong. They also have one character that is not a favorite of mine but kept showing up in the novels. Ariadne Oliver. She is in Elephants Can Remember and Dead Man’s Folly. Don’t get me wrong, these episodes are good but I am not a fan of Ariadne’s character or is it how she is played by Zoe Wanamaker? Though, I will admit that she has slowly been growing on me over the past few series. Plus, it could be worse, Ariadne was played by Jean Stapleton in the Peter Ustinov Poirot films! 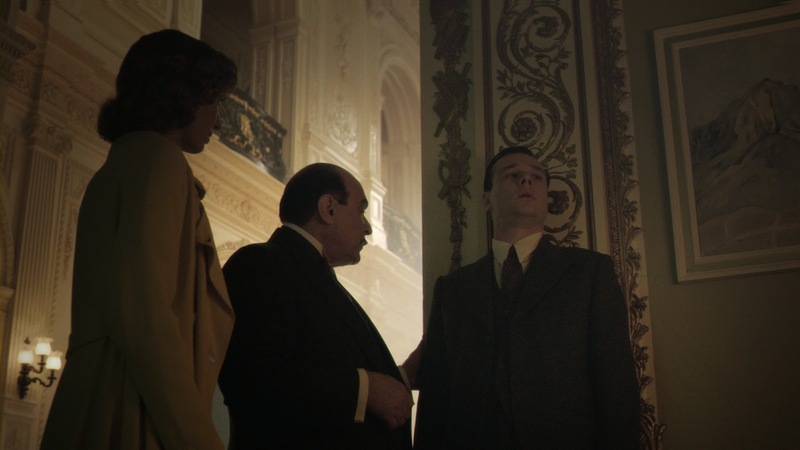 Elephants Can Remember is a good episode where Poirot does not have time to take part in a line of inquiry that Ariadne needs to pursue in conjunction to a murder of her goddaughter’s parents many years ago. It’s an unsolved mystery that she wants solved! 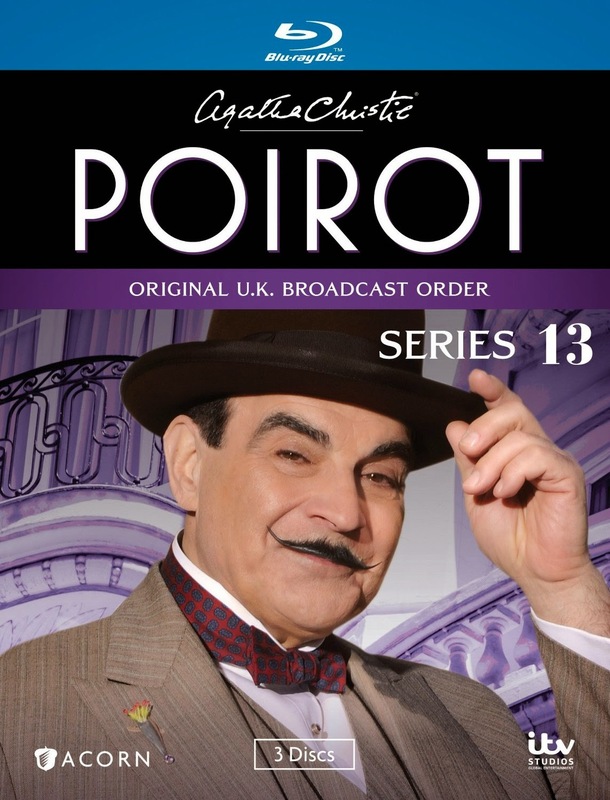 It is only when Poirot finds a link between what she is doing and his case does he become interested. Although Ariadne is no Poirot, she does a decent job of gathering clues based on her investigation. Then again, she should since Ariadne was a mystery novelist just like Agatha Christie. The episode features Iain Glen who is the star of another series released by Acorn Media Jack Taylor but many will recognize him from Game of Thrones. Dead Man’s Folly features Ariadne getting invited to devise a “murder hunt” for a fete at a country home. Ariadne has a feeling that someone is going to be murdered at this event and she sends for Poirot to come down to help her. Does a murder happen? Well, it is an Agatha Christie mystery! I was thrilled to see that this episode features Sean Pertwee who had a major role in Cadfael and is currently Alfred in Gotham. 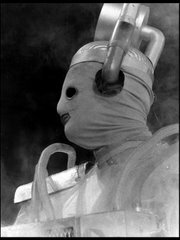 He is also the son of Jon Pertwee. The episode also features Sinead Cusack and Martin Jarvis. Something that really struck me about these stories, with perhaps the exception of Curtain: Poirot’s Last Case, is that these stories are multi-layered and complex. I wasn’t the biggest fan of the episodes that took place between Series 7-9 as they all seemed 1 dimensional but these episodes are complex. One part of the plot or some characters seem to go away or blend into the background and suddenly they come back at the end of an episode in a big way. It’s easy to forget about them. These are really sharp, well made episodes. This is a really strong way for a series to go out. I have watched these final episodes many times now and these are still very entertaining. These episodes look great. Unlike the episodes I reviewed for Series 6 a few years ago, these were made in HD and presented that way. 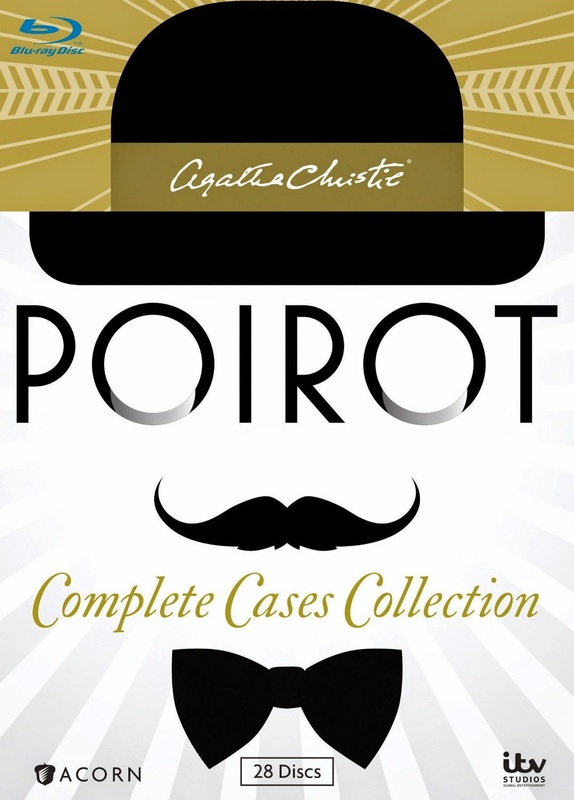 It is very nice to have the entire collection of Agatha Christie’s Poirot on Blu-ray. This is a series that benefits from it especially when seeing all of the amazing locations. There are a couple of extras on this set. 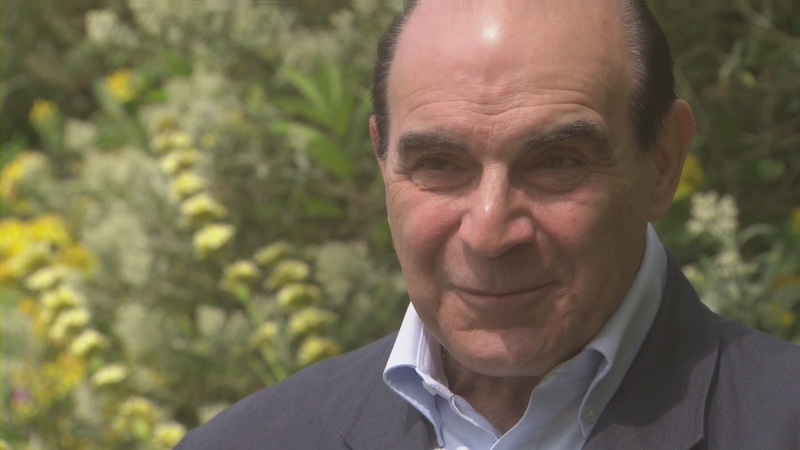 There is a photo gallery and there is 19 min interview with David Suchet. This interview is pretty good and David really comes off as a generous and nice person. I enjoyed listening to him talk about how well he knew Poirot and everything he did to prepare himself to take on the role. It is very fascinating. The problem with this is that the feature is not put together very well. Each question in the interview is a title card with way too much black between the card and footage of Suchet and comes off as a bit amateur which is too bad as that is not how Acorn normally do things. I feel that this set is missing an extra that has showed up on the Agatha Christie’s Poirot Complete Cases Collection. There is a documentary on the set titled Being Poirot. This aired on ITV just as the final episode of the series aired. I thought this was a shoe-in to be on the Series 13 set because a.) it is a nice documentary for fans of the series that have been loyally buying these sets and b.) there seems to be some kind of precedence as the documentary David Suchet on the Orient Express was included on the Series 12 set. There is also plenty of room for the documentary as this is a 3-disc set. Instead this is reserved as an exclusive on the Complete Cases Collection. I am not a fan of this decision and I think it is too bad it is being omitted. Maybe someday a disc of this will be available for the fans who did not but the Complete Cases Collection to have for their own. The one thing that has stayed consistent with the run of Agatha Christie’s Poirot releases is that they have smart covers and pleasant looking packaging. Of course it’s the contents on the inside that is most important but I love the “whole package” which is why even the covers are important to me. It is difficult to say farewell. The whole time watching Series 13, I knew that the series was coming to an end. 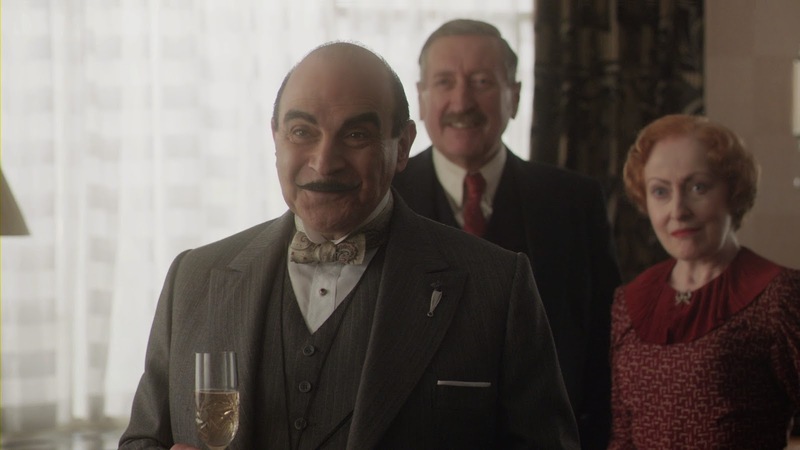 Agatha Christie’s Poirot has been an amazing series made memorable by David Suchet playing that wonderful little Belgium detective. Bon! Even with the issues I have with the extras, I still consider this set highly recommended. Next week: Love is like a butterfly. Some of my earliest memories of watching British comedy on PBS is this little gem called Butterflies. It’s amazing how much of this comedy’s subject matter went over my head when I was a child! Is Love Like a BBC Butterfly?